Hibernation Ends and How Did You Know My Name was Mac? Hibernation is ending and Town Meeting is tomorrow. The sugarbushes are tapped and waiting for a thaw — the same thaw that will signal the beginning of mud season — and the coldest (on average) 90 days of the year are behind us. It’s not like folks weren’t out and about during the cold, dark days, but there is more hope, anticipation and activity now that it’s March. In summer Vermont is dreamy, in autumn glorious, and not without certain charms in winter, but to my mind spring defines her and the character of her people more than any season. Maple, mud and politics glue folks together around here at a time they’re coming apart at the seams and, when just getting out of the driveway is a challenge, the world can seem pretty small. Given everything going on in far away places, it’s darn near a pleasure to spend the whole first Tuesday in March debating with one’s fellow villagers just how much a new box culvert should cost. A thorough examination of these pages will reveal the true identity of this little town, and we are fortunate to hold our Town Meetings just across our attractive village green, in a large room with comfortable seats. Some towns use metal folding chairs or wooden benches to accommodate the voters, which discourage folks from nodding off but also have the advantage of encouraging them to keep things moving along. We spend the day (except for lunch) in a theater. This town was once considered part of another town and meetings were originally held there, way the hell over the hill. Tired of heading out before dawn and climbing a snow covered mountain every time the first Tuesday of March rolled around, the folks over here eventually declared independence and started a town of their own, closer to home. Warm Greetings from the old Green Mountain State! 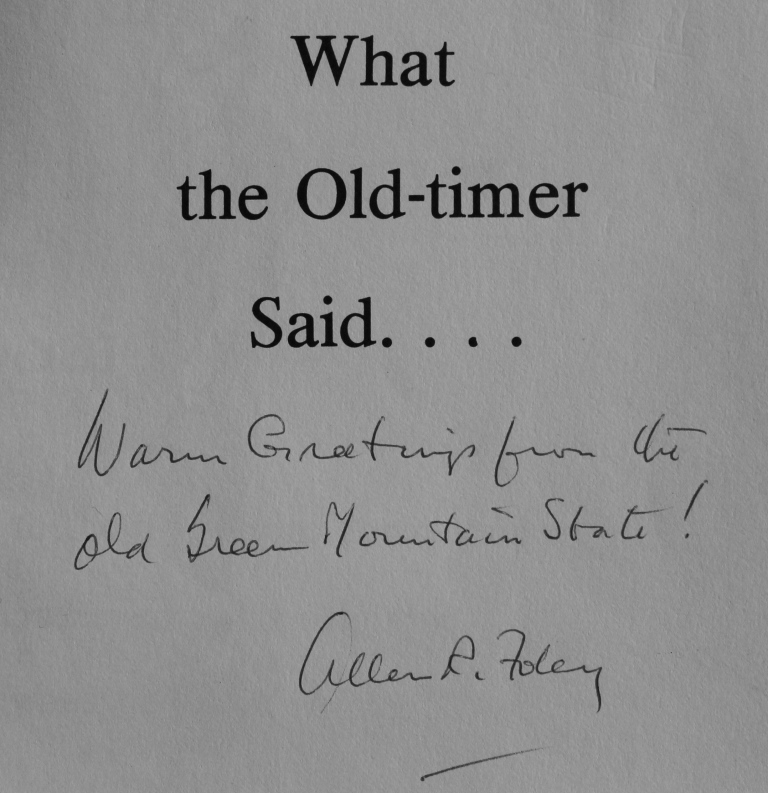 My copy of “What the Old-Timer Said” is from the second printing, released in 1971, and is signed by Dr. Foley. The full title is “What the Old-Timer Said to the Feller from Down-Country and even to His Neighbor — when He Had It Coming.” Despite the long title, it’s a slim volume but it holds a prominent place on my shelf with other collections of Vermont legends, folklore, and anecdotes. Town Meeting is well represented. Two stories in Dr. Foley’s book strike me as especially amusing, one because it exemplifies the thorough reading of Town budgets and deliberative process of Town Meeting (even though the subject and attitudes are dated). The other amuses me because it is as timeless as it is true, coming from a scenario that has played out for as long as there have been roads and people from other places to drive them. 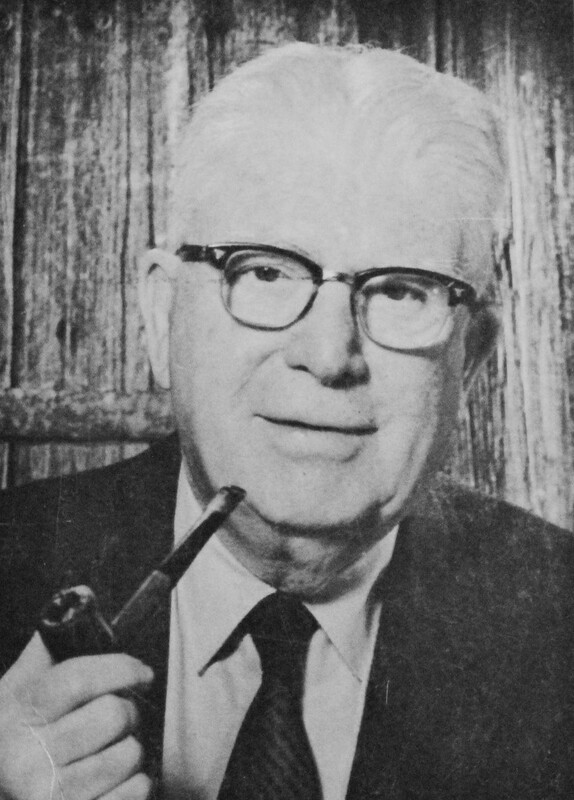 In the old days when Town Meetings in Vermont were inclined to be more expansively deliberative than they are now, and often more personal, a gentleman arose and informed the Moderator that he had a few questions. The Moderator looked at page twenty-one and allowed as how his questioner was correct. The Moderator agreed that was also correct. 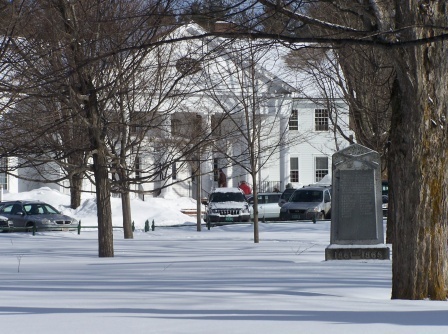 True or not, that’s just the kind of going-over a budget can get when reports are mailed out in February and snow-bound, stir-crazy citizens have a whole month to study them before Town Meeting. I doubt the profitable breeding of young women was ever taken seriously at a Town Meeting, but I guess you never know, especially in a state that once was home to a strong eugenics movement. Tomorrow we will vote on how best to take care of those less fortunate, but not in a way that pays the town. We will vote on allocations to non-profit organizations that serve the needs of our village and neighbors, including food banks, transportation services and the like, along with a medical clinic and doctors we share with five other towns. It seems the Selectmen were asked to “… explain why, during a rough winter, the town roads weren’t getting more sand and salt. Some of the newer residents were particularly vocal, and after some backing and filling a spokesman for that group got the First Selectman to admit that the town had a good supply of both sand and salt. “Why don’t you use them more freely?” asked the citizen. The newcomers still kick up a fuss about the winter-time condition of our town’s dirt roads and the Select Board still explains the finite nature (and rising costs) of sand piles. I look forward to tomorrow’s conversation, and all the others that will seem to have no end. But someone will call the question and we’ll vote whether or not to vote; someone else might call for an amendment and there may even be an amendment to the amendment; a motion will be made and seconded and we’ll vote on that, but if someone doesn’t like the voice vote a division of the house will be in order and we’ll stand up for our yeas and nays; a paper ballot might settle the issue if dividing the house is unsatisfactory or on items where it is required by State Statute and, when that is all said and done, we’ll move on to the next item on the agenda. All twenty-eight of them. Our own tribute to Bob Newhart’s vision of Vermont and people from other places can be found in the post “Thank You for Littering” . The video below, from the movie “Funny Farm” is short, to the point, and very, very Vermont. Funny farm is one of my favorite movies because it told me what New Englanders are really like. Funny Farm only showed the nicest folks. The mail man who threw the mail out his window as he drove by wasn’t far off at all! I can’t stand the stuff, but that beer label is about the most entertaining thing I’ve seen in a while. The fact the some people are actually still willing to gather and debate the minutiae that keeps a community running speaks well. Town meetings like ours are not a stunt that most places could pull off, but at least at the end of the day everyone has a good idea why their town taxes went up or down. It turns out box culverts are quite a bit more expensive than they were the last time we priced one. That has to be one of my favorite beer labels ever. I can stand the stuff pretty well and it’s a pretty good beer, too. Life in Vermont and most New England towns. Well done, Mr. Gordon! You’re most welcome. Great post! It’s making the rounds through our town government as we prepare for Town Meeting. Quill, this is great stuff. Thank you.